Moringa oil possesses exceptional oxidative stability which may explain why the Egyptians placed vases of Moringa oil in their tombs. Moringa oil has a potent antioxidant considered to be the factor behind its remarkable stability. Moringa oil is non-drying nutty flavored oil with a pale yellow consistency. Moringa oil has been used in skin preparations and ointments since Egyptian times. Our moringa oil is derived from the seeds of organic moringa trees. We use a cold press system so none of the nutrients are diminished in the process of creating the final product. Our moringa oil won’t go rancid—it has a shelf life of up to five years and will retain its properties for much longer than some of the other skin care products you might find on the market. Moringa oil possesses exceptional oxidative stability which may explain why the Egyptians placed vases of Moringa oil in their tombs. Moringa oil has a potent antioxidant considered to be the factor behind its remarkable stability. Moringa oil is non-drying nutty flavored oil with a pale yellow consistency. Moringa oil has been used in skin preparations and ointments since Egyptian times. Moringa oil is even showing promise for sunscreen activity. 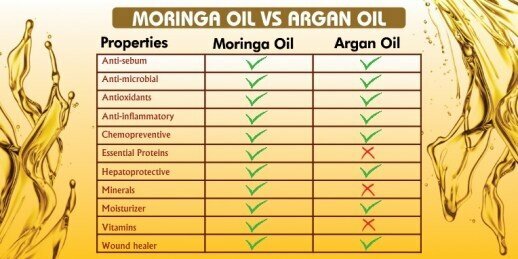 The International Journal of Pharmacy and Pharmaceutical Sciencesreleased a study into the potential for moringa seed oil to be included in sunscreen creams. They concluded, “Moringa oleifera L (Moringaceae) has good sunscreen activity and can be considered as active sunscreen agent or can be incorporated into other sunscreen formulations as an additive to enhance the activity.” This certainly does not mean that you can just slap on some of our high-quality pure Moringa Oil and you are good to lie out in the sun all day. But this study shows some sunscreen-like activity when moringa oil is included as an ingredient in a sunscreen cream, and that it definitely aids in protection from the sun. We see it as another general benefit from the amazing plant and would love to see it included in more natural sunscreens.